Second of my Family Gamer TV videos. You can now find a playlist of these in the links bar to the right. September 9, 2014. Tags: Doctor Who, Doctor Who: Legacy, Family Gamer TV, fgtv, videogames, videos. Uncategorized. Comments off. September 5, 2014. Tags: Batman, Family Gamer TV, infinite runners, Let's Play, The Flash, videogames. Uncategorized. Comments off. Proteus (PS3) and why I don’t like it. 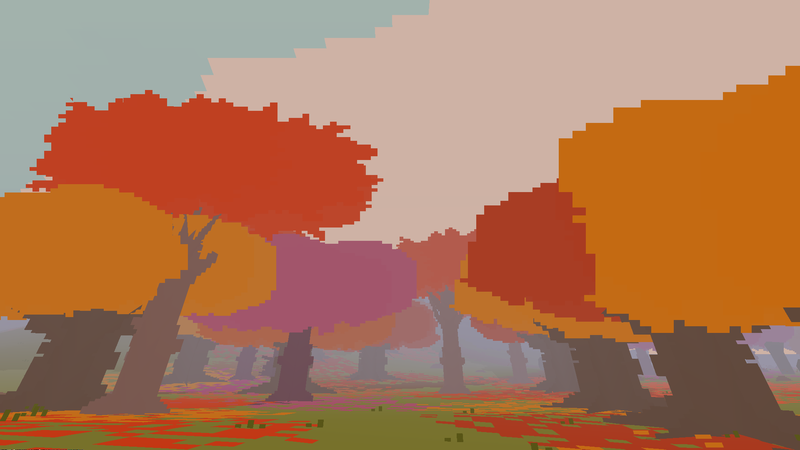 I should like Proteus, and it took me a while to realise why I don’t. It’s not that it lacks violence, or is purely exploratory – the bit of Bioshock Infinite before any shooting was my favourite, and I’ve spent more time exploring Arkham City or the many historical locations of Assassin’s Creed than engaging in action. I love exploration, I’m comfortable with the wordless loneliness of Ico, with the solitude of the wasteland in Fallout 3. So as an idea I find the pure exploration of Proteus appealing, and I’m not an anti-anti-game zealot bothered by the lack of gamey mechanics. Proteus is heavily abstracted, an island of simple colours and two dimensional objects. It’s music and sounds are plinky ambient wibbles. It’s a game where you walk between tree shapes and watch a frog like shape bounce along, each bounce scored with a watery plink. That level of abstraction is so severe that for me it leaves nothing to sink my inquisitive mind into. What I see is what I get out of it – tree shapes, castle shapes, water sky flowers and rain and frog type things. There’s nothing that requires closer examination, nothing to read, no story to unfold. There’s just… stuff. Blank stretches of sea and sky have their charms, but there’s a reason why people being books to the beach. September 4, 2014. Tags: indie, Proteus, videogames. Uncategorized. Comments off. Game People, the site I used to write reviews about storytelling in games for, has over the last year or so moved more and more away from text and got into video reviews on the Family Gamer TV Youtube channel. As part of that, I’ve been attempting to do videos for the channel, with the plan to stack a few up and perfect the format before launching them as a little sub-strand within the channel. The schtick was that I was reviewing grown-up games ‘after dark’, which simultaneously suggests something more urbane and sleazier than me rambling at a camera about Arkham Origins but there you go. Unfortunately the plan didn’t work, out after months of tryouts and attempts. Light conditions in my house are incredibly poor in terms of recording the to-camera links, and setting up tripods etc meant I could only really film when I had the house to myself. Recording off-screen games footage was a mess, the camera never quite lining up with the TV. The whole thing created a massive editing job for Andy at Family Gamer and, in one final crisis, I found that two reviews worth of my to-camera footage had bad audio recording because of some mess up with either my phone or the mic or both. At that point we cut our losses. While we’re still working on me doing something for the Family Gamer TV Youtube channel, probably closer to a Let’s Play format with me talking over directly captured game footage, the reviews I’d been working on are effectively useless. Still, I got the review copies, so it would be nice to belatedly actually talk about the games somewhere, right? For the last couple of reviews I worked off pretty detailed notes, complete with annotations as to where in-game footage should go, and Andy Robertson of Family Gamer has kindly allowed me to run them here. Intro – Hello I’m Mark Clapham, I’m a writer and parent to a daughter, and I like to play games after she has gone to bed. Games that provide an alternative to an endless cycle of wholesome cartoons and stories in the day. These are my late night reviews of games that are definitely not for the whole family. With one exception that we won’t go into, you can’t get a more adult genre than horror, and probably the single biggest name in horror gaming is the Resident Evil series. Resident Evil 6 is the most recent instalment, and has been out for a while for Xbox 360, PS3 and PC. Unfortunately I can’t really recommend it as a horror game, especially one for busy parents to fit into their evenings. If nothing else it’s a big game, trying to live up to the size and history of this long series with a globe-spanning plot that splits into three main storylines featuring characters from many past games in plots that echo those older games. There’s Leon Kennedy from 2 and 4, dealing with zombies in a spooky old buildings There’s Chris Redfield from 1 and 5, having the more trigger happy battles with funny-headed mutants we saw in 4 and 5. More interesting are Jake and Sherry, children of different villains from the series, who provide something a bit newer to the series, including a more convincing romance than Leon’s bizarre infatuation with Ada Wong. Oh yeah, Ada Wong’s in it too. She mainly does that thing with the zipline she does. Unfortunately, these old school characters don’t bring old school Resident Evil horror with them. If that doesn’t sound much like an atmospheric horror game, you would sadly be right. Resident Evil 6 is way too big, too open, to really build tension, and mainly consists of boxy areas where you spin around strafing baddies with funny heads. There’s very little tension, just a wearying pile-up of set pieces. It’s disappointing to sit down for some late night scares and instead encounter such generic action. In it’s attempt to be a blockbuster, Resident Evil 6 loses almost all the horror. If you have young teens who are accustomed to gore, you probably wouldn’t be too worried about letting them play this, as there are very few mature scares. The sheer bloat of the game, combined with a terrible save system that makes it hard to keep track of when you can safely put the controller down without losing progress, makes this a hard game for parents, or anyone else who doesn’t have spare five hour gaming sessions to hand, to play. A lot of these design flaws are because the game is angled heavily towards online co-op, which is a bit tricky for those of us who don’t have the time to have long co-op sessions. Also, multiplayer doesn’t lend itself to slow burn tension, and prioritises fast action, if not fast game session. One casualty of the online friendly action is any of the background detail that used to make the worlds of previous Resident Evil games come to life. There are no documents to read in-game – though you can read some from a juke box in the extras menu – no audiologs, nothing to stop and look at. It makes the whole game disappointingly shallow, and fails to build any real atmosphere. There are also very few puzzles, as that would presumably slow the game down by requiring thinking. It’s a shame, as Resident Evil 6 is a really beautiful game, with gorgeous visuals and sound. then, but shallow, expecting nothing of the player but to run and shoot. There’s the odd genuinely good quiet bit, like a drive through a city shrouded in poisonous fog, but these are few and far between. Ultimately Resident Evil 6 is a long, repetitive game that feels even longer and more repetitive due to the way the plots intersect, meaning that if you play all three campaigns – and with a lot of unique settings and scenes in each you’ll want to – you’ll fight certain boss battles, which were dull first time around, again from a different angle, which is kind of structurally clever but also boring and annoying. In the end, while it has a lot of gloss and explosions, Resident Evil 6 is too unwieldy and bloated to recommend, to the extent it took me over a year to find time to complete the thing. Please follow the FamilyGamer TV Channel on Youtube for more of my reviews, as well as reviews of games for those difficult times when the children are awake. You can also follow me on twitter at @markclapham. Good night. June 26, 2014. 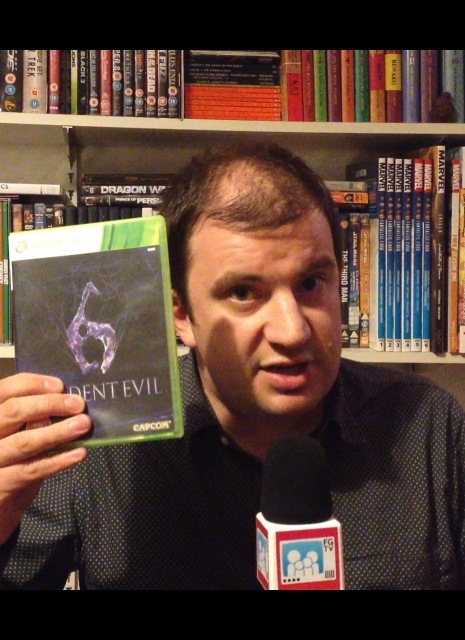 Tags: Family Gamer TV, Resident Evil 6, reviews, survival horror, videogames. Uncategorized. Comments off. I have a lot of time for Ubisoft, and I think their E3 presentation this year had by far the most stuff I’m interested in. I also like that they hire an actual media professional who can go on stage without seeming like a quivering PR robot to host their conference. That said presenter is Aisha Tyler, a woman of colour in a sea of white male techs and execs, makes the fact that the couple of niggles emerging relate to the presentation of women in their games all the more galling. But I think this is a case where success has led to the emergence of unexpected problems. Reading a recent Edge article on Ubi’s editorial team, the squad of advisers who share best practise and approve or reject projects in the sprawling company and its sub-studios, it’s hard not to admire the administrative machinery they’ve put in place to ensure these massive AAA titles are laser targetted at what Ubisoft’s audience want to play. There’s a growing awareness, especially amongst critics, that this is blurring a lot of the company’s games into one Uber-ubi-game, with tropes like Parkour and side missions and taking control of certain locations to open up the map spreading from game to game. Of course, the reason these open world game play elements are so pervasive is that they work, that they appeal to a broad audience and provide an addictive framework of progression and exploration with lots to do. Some critics may have been disappointed in Watch_Dogs (I haven’t played it yet) for its recycling of bits of Assassin’s Creed etc but it sold shitloads. Maybe not everyone who bought the game was pleased to have the chance to play Chess in the park or engage in optional car racing but the presence of those ticks on the packaging certainly didn’t put them off. These things appeal to me. They appeal to a lot of people. If there’s a generic gamer brain, a point where the various circles in the big Venn diagram of genres and gameplay options available to Triple A developers overlap the most, Ubisoft are great at marking it out and occupying that territory with populist action potboilers. And Ubisoft’s E3 presentation was full of that stuff, from Far Cry 4 to Les Assassins Miserables (apologies to whoever on Twitter’s joke that was) to the Division. Even outside that big blurry open world action space each project was the most amped up version of that experience you can imagine – Just Dance was relentlessly poppy and bouncy, the fitness game was the gamiest fitness game ever seen, Rainbox Six Siege finessed that squad shooter thing to it’s most intense and streamlined incarnation. See marketing target, focus on marketing target, launch mini nuke at marketing target. Boom. The problem with hitting the tastes of the generic gamer, of the person you get when you smudge all your audience research together and create an archetype of who you’re making games for, is that you end up excluding diversity. You know that X percentage of gamers are white men so that’s who your protagonists are, maybe throwing in black NPC character or secondary playable character because you don’t want to ignore those gamers altogether. And as for women… well, they become what women get stuck with being in a lot of action fiction in films or books or TV, inert sources of motivation for the player. In aiming for the widest audience, in targeting the universal lizard brain part of the largest spread of gamers, you end up creating regressive nonsense. You have a Rainbow Six demo where two teams of men fight over a frightened woman, guiding or dragging her from room to room as the men shoot each other. You dabble in having female assassins in Assassin’s Creed Unity, then drop it because it requires more mo-cap or different takes of the dialogue for different pronouns and it’s not a budgetary priority because you’re aiming at the generic tastes of uberubigamer so you think it doesn’t matter beyond a scattering of negative headlines. But it does matter, not just because such a mindset is regressive and exclusionary and blinkered but because variation and diversity is required to keep things interesting. That’s the danger of the editorial mandate, the focus on what already works – there’s no preparation for when the current tricks wear thin. It’s no use building all these detailed cities and jungle covered islands to explore if we’re doing it with the same old characters with the same old motivations about dead or kidnapped girlfriends and daughters. Diversity of characters as well as diversity of scenery, please. 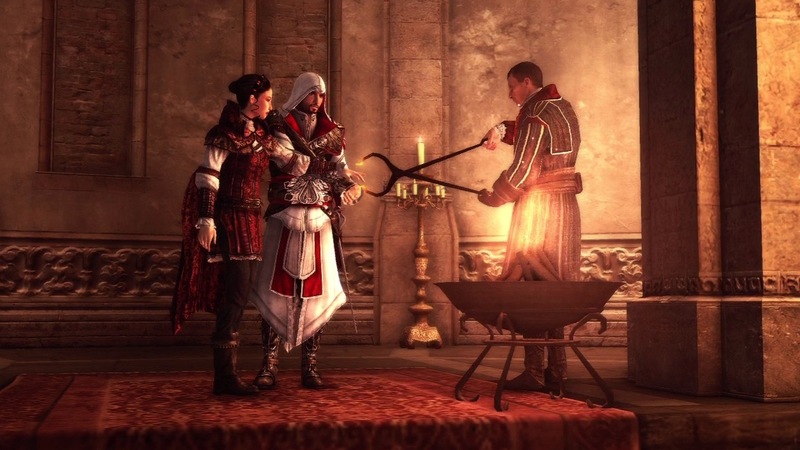 Also, I still want to play an Assassin’s Creed game as Clauda Auditore. Get on that. June 11, 2014. Tags: aimless whinging, Assassin's Creed, Ubisoft, videogames. Uncategorized. Comments off. Science fiction comics don’t seem to be as big a sell as you would think, even though genre and medium seem a perfect match. Maybe it’s that the superhero genre cherry picks and co opts SF tropes so effectively that most ‘straight’ SF comics feel like old news? Whatever. Here’s an SF comic that really works. Black Science, by Rick Remender and Mateo Scalera, has a singular vision, a modernised pulp SF that combines two-fisted science heroism, lost worlds, forbidden knowledge and a reality skipping macguffin, then filters it all through a visual sensibility akin to an exceptionally lurid prog album cover. In a striking first issue we meet anarchist scientist and professional dickhead Grant McKay already out of his depth, lost in a world of barbarous frog people, and the series barely lets up from there, drip feeding in back story as the main plot rolls ever onward. Remender and Scalera’s collective imagination deliver six issues of varied alien weirdness, with memorable imagery but a less sprawling story than, say, East of West. Where that book has a cast of hundreds, Remender keeps us close to McKay and the people he’s dragged into this world-hopping mess. While the hard boiled cynicism of the narration and constant conflict between the leads could seem trite in a different series, here it works, that level of bleak ferocity fitting neatly into a story of constant crisis and threat. Whether Black Science can maintain that intensity without getting wearisome is a question for volume 2, which I eagerly await. June 3, 2014. 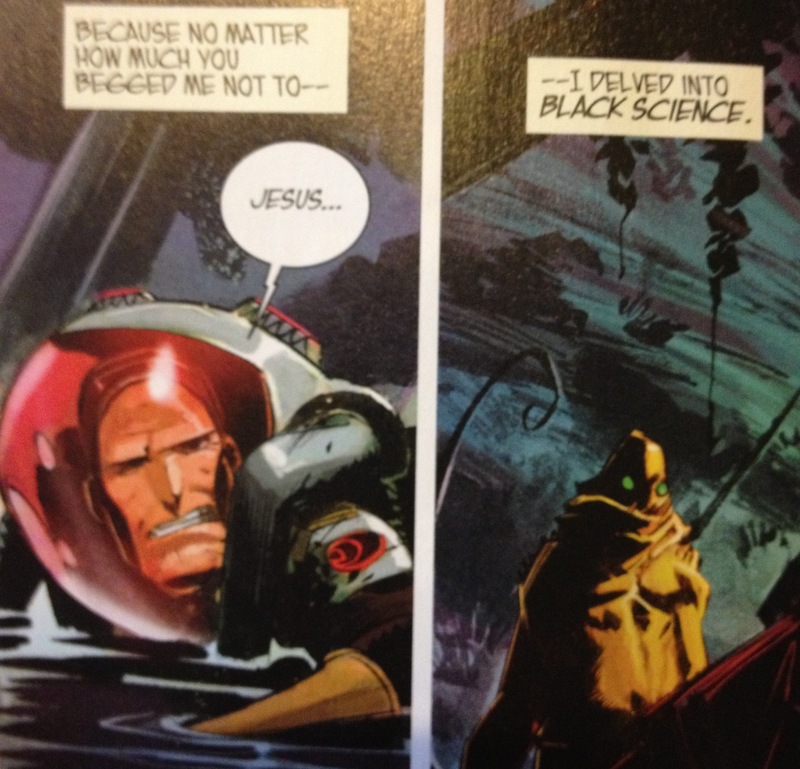 Tags: Black Science, comics, Image, Mateo Scalera, Rick Remender, Ten minute reviews. Uncategorized. Comments off. IDW have been publishing The X-Files comics for a while. I get them all at a standing order at my old comic shop in London (Gosh!, as if there was any doubt), and read a stack over the weekend. Here’s a few thoughts. The core series is the ‘Season 10’ ongoing, which picks up after the TV series and startlingly dull second movie. With Chris Carter on board in some kind of approval role, writer Joe Harris has managed to cleverly reboot the series back to its baseline formula – Mulder and Scully at the FBI – without entirely overwriting what had come before. Part of the success of Season 10 is that, by making the plot device of characters coming back from the dead by mysterious means the main arc of thIt’is new season, Season 10 bakes the reintroduction of old, killed-off characters into the premise rather than doing it in a throwaway manner. Yes, it is a little bit of a cheat, but the comic is working hard to justify it in the long-term plot. Season 10 is smart and snappy, with some great art from Michael Walsh on early issues, Matthew Dow Smith (displaying a sharper line than I’ve seen from him in the past) as the new regular artist from #11, and some mixed guest artists in between. As has always been the case since Charlie Adlard drew the Topps X-Files comic first time around, the series is most successful the clearer and sharper the line. Too much scratchy horror or curved superhero gloss and it ceases to feel like the subdued world of The X-Files. It’s a fun ongoing, authentic to the TV show with fan pleasing touches. Other X-Files titles have been less successful. Last week’s Annual is probably best glossed over, with exactly the miss-steps in art tone I mentioned above, and a Dave Sim written back up where a dreaming Scully talks to a floating hand representing her ex. More interesting, and frankly bizarre, is The X-Files: Conspiracy, a crossover between the title and several other IDW licences where the Lone Gunmen hit the road to stop an imminent viral outbreak and meet the Ghost Busters, Teenage Mutant Ninja Turtles, Transformers and the Crow. Most of the issues aren’t very good – the book-ends are perfunctory, and a lot of the art doesn’t feel quite up to scratch. However, two issues do jump out. 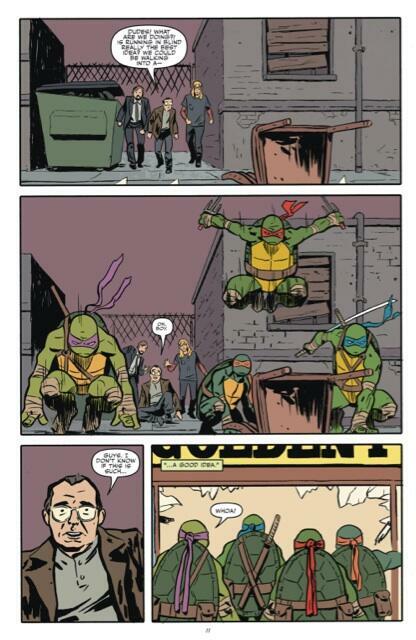 Firstly, the TMNT crossover is really fun. 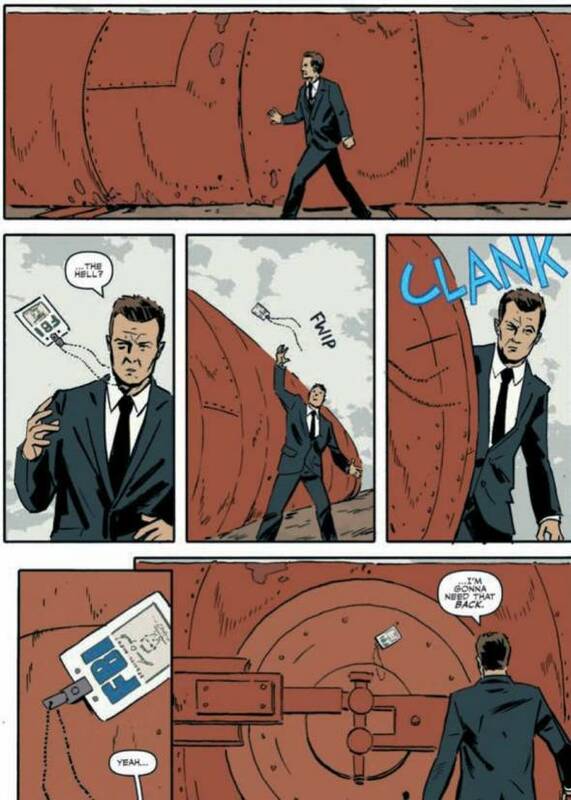 It helps that Michael Walsh is on art, so the book looks beautiful (with colours by Jordie Bellaire, colourist on a lot of these books – in Season 10 she’s really captured the palette of the TV show), but also that writer Ed Brisson knows EXACTLY how silly the premise is, and plays it just right. That it’s a sequel to a really fun X-Files TV episode just adds to the indulgent fun. 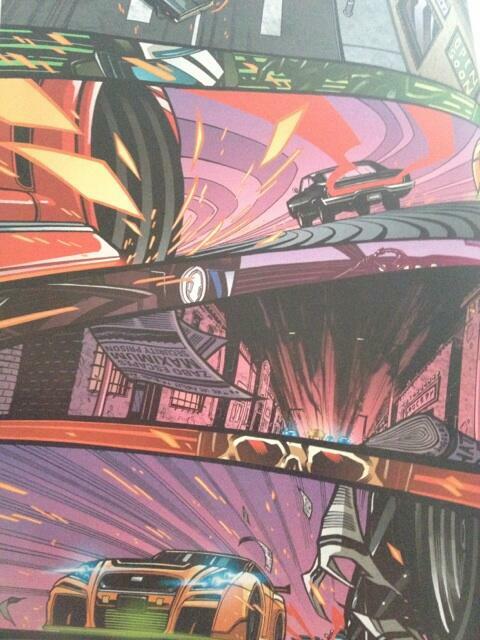 Secondly, the Transformers issue works in a completely different way, scratching a long term itch of mine. In showing the Transformers as you would expect them to appear in The X-Files – as mysterious, hulking figures in the dark – writer Paul Crilley and artist Dheeraj Verma (with suitably intense colours by Joana Lafuente) recapture some of the mystery and magic of early UK Transformers strip Man of Iron, a personal favourite. It’s not a masterpiece, but it did present a side to the Transformers all too rarely seen, and that gave me a thrill. May 6, 2014. Tags: comics, Dheeraj Verma, Ed Brisson, Ghost Busters, IDW, Jordie Bellaire, Michael Walsh, Paul Crilley, TMNT, Transformers, X-Files. Uncategorized. Comments off. I feel weird whenever I go through an extended period of not buying Batman comics. From the tiny digests that I owned as a kid, to UK reprint titles, petrol station spinner racks and eventually visits to comic shops, Batman comics have been a staple of my comics reading. When I’ve been underwhelmed by the current DC output, or had to cut back due to lack of money, it’s felt like an unscratched itch. Lately I’ve been getting the Snyder/Capullo Batman in paperback, which means I’m years behind, and reading the odd mix of recentish Batman titles reprinted in the UK. The Snyder stuff is great, the rest a mixed bag, and it’s all very infrequent and irregular. I do still buy two or three US comics a week though, and so I’m susceptible to the more regular diet of a weekly Batman comic in the form of Batman Eternal – providing I can justify paying for it every week at the expense of all those all new Marvel titles, Image books etc. Batman Eternal is a weekly book developed by a team of writers including, and presumably led by, Scott Snyder. The writing team and weekly schedule suggest something closer to the approach of a TV show than a monthly comic, and that’s what these first two issues set up, building a sprawling ensemble and setting various hares running. The danger of a project of this scope is that twenty pages isn’t much to set up the sprawl that an epic weekly series is going to need, and indeed it’s not clear by the end of #1 the scope of what Eternal intends to be. The first issue has a flash forward to horrible future events, introduces the characters at the Gotham City Police Department via a newbie to the force, then throws us into the big action scene that’s the inciting incident for this story. It’s kind of intriging, artist Jason Fabok does very solid Bat-work in the very Arkham-game-influenced New 52 mould, but it doesn’t quite explain what this whole weekly series is actually going to be about. #2 sets things up a lot better, exploring the ramifications of the incident in #1 and, in a final page reveal, showing who is behind it all. As such I’d actually recommend #2 as a sample more than #1 – the first issue’s events are recapped well enough, and by the end of this second issue the reader’s reaction to what is revealed should provide a good indication as to whether this is your kind of series. On one level it’s just a villain reveal, but the implications are for a story that’s wide in scope and go to the heart of what makes Gotham and the Bat cast distinctive. It should be fun, and for now I’m in. Apart from anything else I’m curious to see how the series competes for my attention over the long haul. When I last read a weekly series, 52, I had more money and time for these things. Can Batman Eternal compete with other distractions? We’ll see. April 17, 2014. Tags: Batman, Batman Eternal, comics, DC, James Tynion IV, Jason Gabok, John Layman, Ray Fawkes, Scott Snyder, Terrible phone photographs, Tim Seeley. Uncategorized. Comments off. What’s the point of Marvel still publishing comics? Last week I wrote a bit about how Marvel seem to be flooding the market with new comics, to the extent where it’s hard to keep up with new issue 1s, never mind the issue 2, 3 etc of all these series. With the movies and associated merchandise making so much more money than printed comics, you may wonder, as many people have, why Marvel bother with comics at all any more – why don’t Disney just slash and burn the publishing division to concentrate on films, toys, videogames and other things that turn much bigger profits? On one level this might seem to make sense, as the films etc are mainly sourced from much older material. Leaving aside the most recent sequels like Winter Soldier and Iron Man Three, which explicitly draw from comics published in the last decade, the first Iron Man, Thor and Captain America films told the origins pretty straight, mainly recycling characters and plot concepts that date back to the dawn of Marvel. The Avengers was The Coming of the Avengers, the main plot inheritance from the more recent ‘movie-friendly’ Avengers revision The Ultimates being the alien invasion. 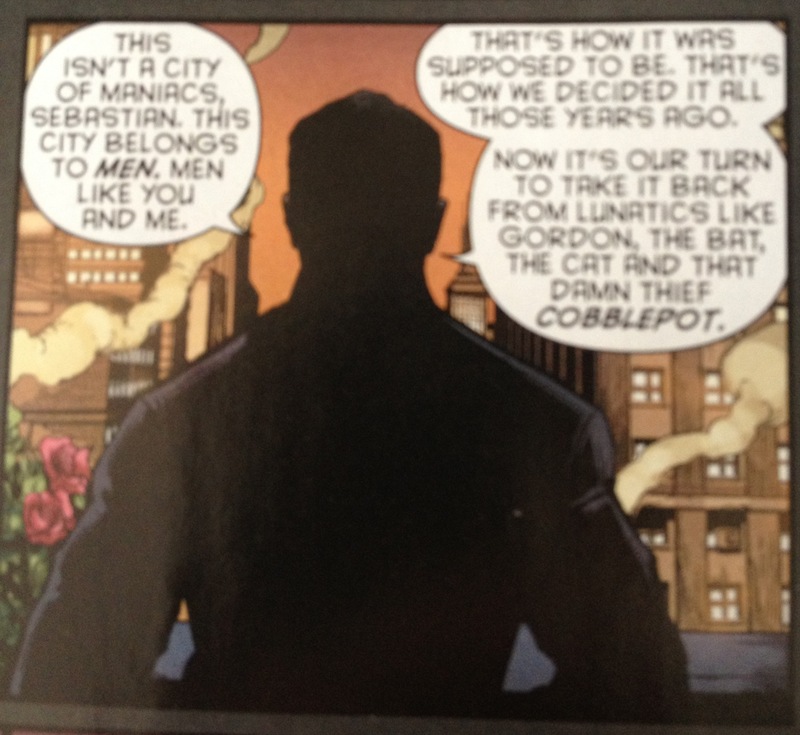 In terms of synopses it’s hard to see why Marvel just don’t stick to drawing on a pile of ancient back issues. It’s not like the comics have turned out many major entirely new characters in the last two to three decades of publication, instead concentrating on the old mainstays and ‘legacy heroes’, i.e. new characters taking on the superhero identity of an earlier hero. This is however taking a shallow reading of how the characters transfer to the screen, to presume that, because most of the plot beats and the essence of the characters remain the same, that there is an effortless movement of characters from the works of Lee, Kirby and Ditko to the movies we see on screen. While it’s true that, at the core, these are the characters that Stan, Jack and Steve created, it would be a mistake to underestimate the cumulative effect that decades of publication have had in keeping these characters and concepts relevant to a modern audience, in trying out different stories and experimenting with different takes. It’s to take no credit away from the original creators to suggest that, without those years of continuous publication suggesting ways in which these characters might be accessible to cinema audiences, The Avengers might be closer in status to the THUNDER Agents – a curio familiar mainly to devotees of old comics – than the pop culture juggernaut they now are. Before Marvel Studios came along and started more seriously mining recent comics for stories, this influence was mainly visual – Marvel would go to directors and producers considering, say, a Hulk film through Universal, and present a concept book of pages from recent Hulk comics. You can see this in the Ang Lee Hulk movie, with set pieces taken straight from the Ennis/McCrea Hulk Smash comic and slapped on the screen. That kind of influence still persists, with Iron Man Three drawing the imagery of Tony dragging his broken armour through the snow from the recent Most Wanted storyline while much of the story itself comes from other comics. While it’s dispiriting to think of comics as just a dry run for ideas to be used in films and games and TV shows, it’s undeniable that they make a relatively cheap test bed for ideas compared to those media, and that the more realistic style of comic book art popularised in recent years creates images that are easier to adapt to the screen. It’s arguable that all the textures and details on Captain America’s costume in a John Cassaday or Bryan Hitch comic are unnecessary in the abstract world of a two dimensional comic, but they certainly provide suggestions to costume designers and producers of how such costumes might be adapted to real life actors. For all their iconic simplicity the costumes of golden and silver age comic book characters work because they exist in a world of sharp, clear lines not real people. An actor can’t look like a Jack Kirby drawing any more than a real person can embody the simple lines of Mario in Donkey Kong, as anyone who has seen the Bob Hoskins Super Mario Bros movie will know. 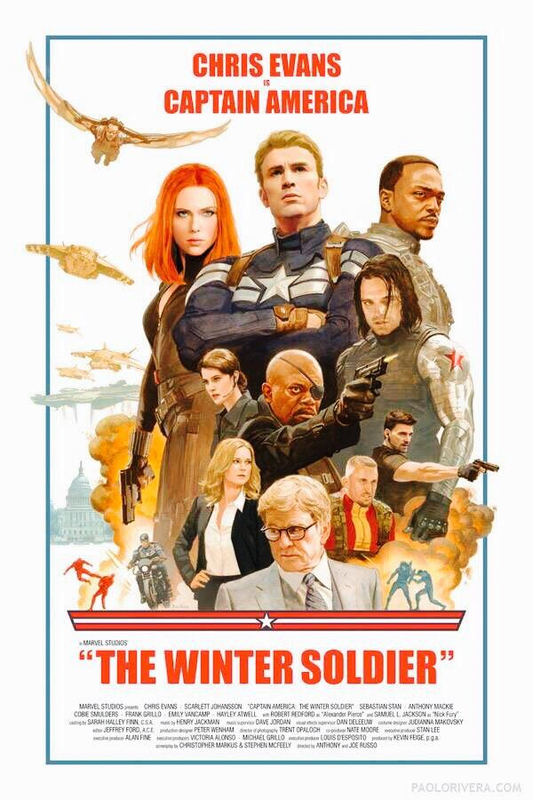 Now that the origins are out of the way, the Marvel Studios films are using the long history of the comics as a deeper well for characters and stories, with both Iron Man Three and The Winter Soldier drawing heavily on recent storylines while also throwing in characters from earlier eras, reinventing them in the process. Yes, screenwriters could come up with completely new storylines, and I’m sure sooner or later there’ll be a Marvel sequel that draws entirely from the cinematic universe, picking up threads from the films without drawing heavily on comic book material. But in a film industry hungry for ideas to get on screen, Marvel has the advantage of a publishing division that does nothing but churn out endless ideas for the new films, both in terms of stories and arresting visuals. While the comics remain profitable, there’s no reason why the publishing arm shouldn’t keep going, the comics readership acting as a paying focus group. You can see Marvel leaning into this role with its recent launches and relaunches. Marvel Now and its successor, All-New Marvel Now, are throwing new ideas and visual approaches to a wall to see what sticks. A Moon Knight in a suit, easier to do on screen, in a more procedural type story that would work as a TV series? Silver Surfer as a Doctor Who-ish SF adventure? New spins on Black Widow? A new take on Ghost Rider that’s a step away from the Johnny Blaze version tainted by two Nic Cage movies? 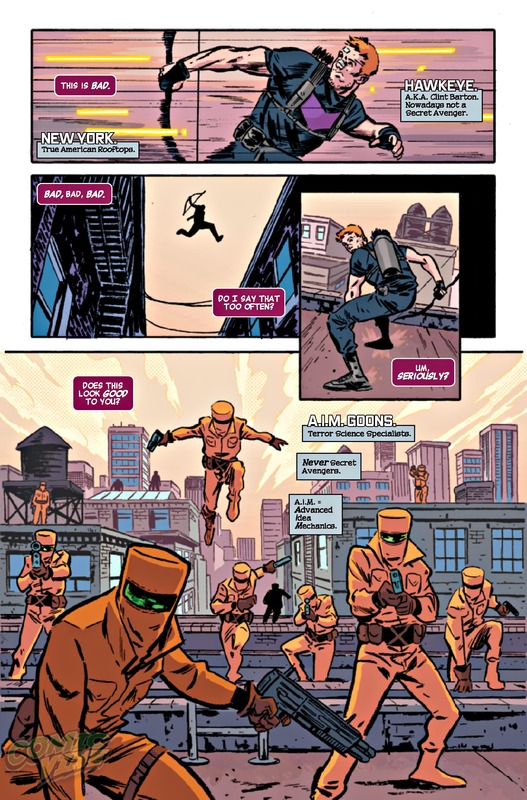 A Secret Avengers series that teams the more grounded characters from the Avengers movie up? All here. There’s a lot of material there. As I said the other week, possibly too much – as the House to Astonish podcast pointed out, Marvel are heading towards having 53 monthly titles, one more than DC’s ungainly New 52. But there’s a certain creative freedom involved in feeding the machine, an encouragement to let the comics be as wild and comicky as they can be, to try new approaches, even if it’s with old IP. Nobody seems to be telling comics creators to make something that’ll be a good movie, but to try new things in the comics and let the movie/TV people work out what they want to cherry pick at a later date. In some ways it’s an ideal meeting of commercial cynicism and creative storytelling, which is really what one would hope for from a company liked Marvel. Excelsior and all that. Thanks to Aaron Smithies (@snarkandfury) and Ash (@Ravenevermore) on twitter for chats that led to this piece. Go follow! April 8, 2014. Tags: All-New Ghost Rider, All-New Marvel Now, Captain America: The Winter Soldier, comics, Iron Man Three, Marvel, movies, Secret Avengers. Uncategorized. 1 comment. A couple of these warm-up reviews have been about new Marvel comics that have been part of the company’s current wave of All-New Marvel Now issue 1s, All-New Ghost Rider (pictured) and Secret Avengers. But there are #1 issues I’ve bought and not got around to mentioning: Iron Patriot #1, for instance. And ones which predate me doing these reviews, like Loki: Agent of Asgard #1 and Winter Soldier: The Bitter March #1. Then there’s Marvel series from the last year – and indeed the previous wave of Marvel Now – which I’m still reading, like Mighty Avengers which is only up to #8 and now seems old guard. Or series from that wave like Jonathan Hickman’s Avengers, Kieron Gillen’s Iron Man or Mark Waid’s Hulk that I’m trying to keep up with in trade as the single issues flood past. Now a lot of these are very good, and a lot of Marvel Now/All-New Marvel Now launches are less good, but the one thing the lot of them have in common is that they constitute A LOT of comics. In some ways relaunching often is a good thing – a new #1 is a good try out, and it certainly works with me as the number of #1s I have picked up lately indicates. I like to try new things. In fact, there are recent issue 1s that I never got around to – last week’s Silver Surfer #1, or Moon Knight #1 or Ms Marvel #1 from the last month or so, all of which just constituted one too many books on the pile for my limited budget. They’re coming so fast that the new #1s aren’t just competing with older books, they’re rolling over each other to an extent my wallet and, frankly, reading time, can’t keep up. Lots of good comics are a good thing, but Marvel do have A LOT. And in the case of their bigger titles, they double ship them, so the comics come out 18 or 24 times a year and there’s a new ten, fifteen quid paperback collection out every few months for those of us reading in trade. And I don’t just read Marvel. I read very little DC, but I keep up with a couple of titles and dabble in the odd one-shot or anthology that seems interesting. More significantly Image are churning out a ton of great new books, which I’m picking up either as singles or trades. Now, what the competition does isn’t Marvel’s problem and it’s there job to take readers’ money that could be being spent on competitors’ books, but the churn is so relentless now it’s hard to see who could keep up with the new launches without at least dropping slightly older books before giving them a chance. Something has to give, so skip #9 of Mighty Avengers, #3 of Loki or a new #1, or just skip the lot, wait until the trades come out and buy them on the basis of the opinions of people who stuck the course over that first year? I can’t be alone here, the sole person with limited budget – and I’m certainly far from austere with myself when it comes to buying comics – who is being left behind a bit. It’s hard not to see a currently successful policy of constant #1s becoming self-defeating very quickly – sales dropping off quicker and quicker as readers drop books that have reached the mature age of #5 or #6 in favour of the latest #1, which in turn drops off quicker and quicker… and so on. Now, I tend to hate the constant fishing for comments with ‘what do you think?’ on news stories that readers almost certainly won’t have an insightful opinion on, but in this case, reader to other readers, I’d be genuinely interested to know – is it just me? April 2, 2014. Tags: All-New Marvel Now, comics, Marvel, Ten minute reviews. Uncategorized. Comments off.